Got your social media communication right? When everyone started using Social Media for brands in early days, content writing was looked upon as just that – ‘content’ writing. It focused on the basics, i.e., providing information about the product, having some quirky updates on something related to the brand, some polls, some crossword / unscramble games, quizzes about products or related items, and some interesting insights on brand profile. Well, we have certainly evolved since then. With social networking sites changing the very nature of human communication, especially with newer interfaces and more importantly, newer ecosystems we think differently now. The focus on simple engagements in a bid to get more conversations, comments & retweets alone is now history. With the evolution of social media within the country, audiences are all the more aware about what brands stand for. As always, social media is not about broadcasting but about engaging and invoking a thought within your audience and driving home a point at the end of the day, which then relates to your personality as a brand. Today’s content and communication is more about how well you know your community, how well you moderate it and how comfortable the community is to reach out to you. To do all this, communication is the key. How do get our social media communication right? Ask yourself one question – What will my brand be known for when the audience consumes my content? Research your brand on various other platforms and what they are doing through other channels. Break up your target group. Give a character sketch to whoever you are talking to. Try to guess what kind of content would really make him/her engage with your brand. Identify what kind of communities this target group audience is already talking in and converse with them over there. Have a focus on the central theme of what your brand stands for. Try to find communication pegs that revolve around that central theme. Decide what tone and what manner you would like to communicate with your audience. Philosophy: Root of all evil is hunger. Kill Hunger, Kill Evil. Kudos to Creativeland Asia for coming up with a fantastic microsite. You have to check it out for yourself to experience the excellence of their communication and how it talks to its userbase. They have a great engagement which talks to them, all revolving around Hunger. 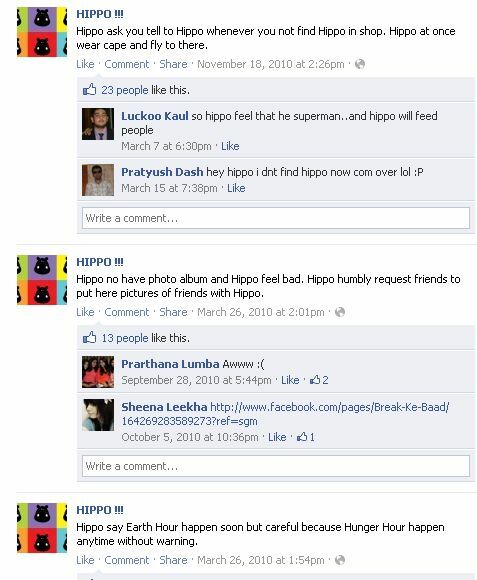 Hippo Vs Hunger: Short game where you have to feed various personalities (Hitler, George Bush, Saddam Hussein, Joker, Rakhi Sawant, Dawood) to kill the evil inside them. 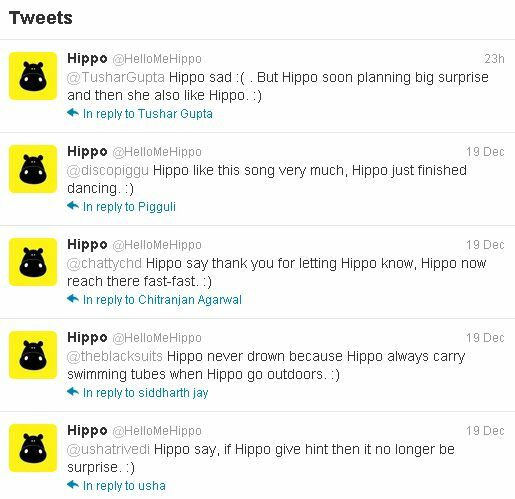 A day in a Hippo’s life: Interpretation of great speeches by Hitler, Saddam Hussein via Radio in Hippo’s words. A funny take on how Hungry these personalities were and relating that to their philosophy. 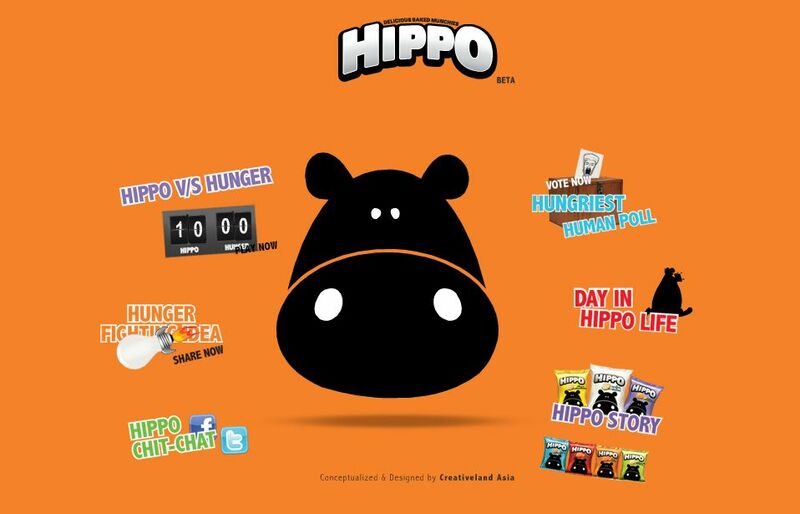 On twitter & facebook, Hippo talks with folks, giving them tips on Hunger, food and general conversation in a tone of Hippo. The English is Hippo style but relates with the youth / TG. Their Angle: Healthy start. Healthy Breakfast, Health Food. 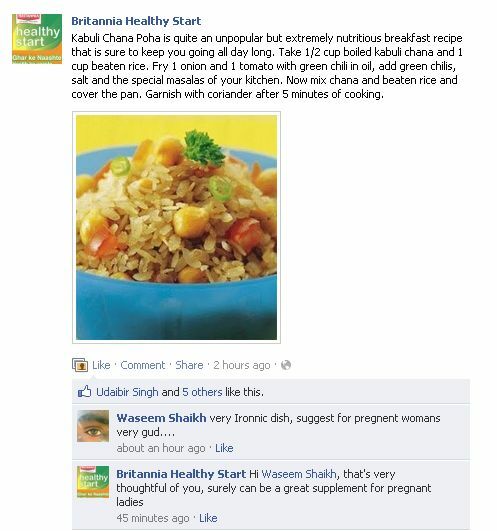 Communication: As of now, they are doing a facebook page called ‘Britannia Healthy Start’. Healthy start is a great title for a page related to breakfast food. Most of the communication is about healthy breakfast tips and visual images that will appeal your user about the whole health food and nutritious breakfast related content. Philosophy: Everyone is a Hero. Mujh mein hain Hero. Their Angle: It’s about the Hero inside you. Communication: Now a couple of things that the brand has done are good. But this is a classic example of how brand communication can be better than what it is really. And this brand has the potential to be better, for sure, considering their angle. 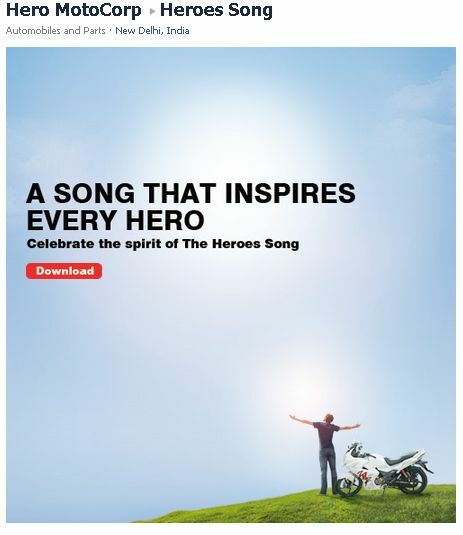 Recently, Hero Honda parted ways and the company’s just Hero Motorcorp. What they did in the real world was a great campaign in terms of signifying Hero and relating to everybody by motivating them about bringing out the ‘Hero’ inside them. However, their facebook page mostly talks about their product and some updates from current affairs, that may relate to their philosophy. Talk about Unsung Heroes in daily lives. Heroes that we have encountered on a daily basis. Heroes that have made a difference and inspired people. 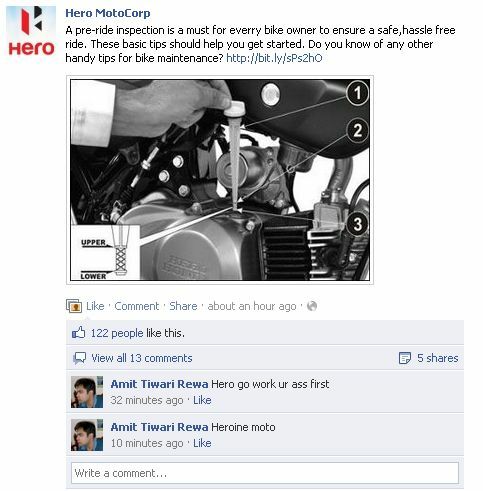 Feats and achievements shared by users which bring out the hero inside them. Talk about Heroes in various fields (Movies, Sports, Education, Politics, Art, Fashion, Music, Modeling). Historic events of various heroes that can inspire people. Movies where the common man is the hero. TIME Magazine cover 2011 (The Protestor) who in a way is the hero of 2011. Their Angle: None showcased (not at least on their Facebook page. They just share news). 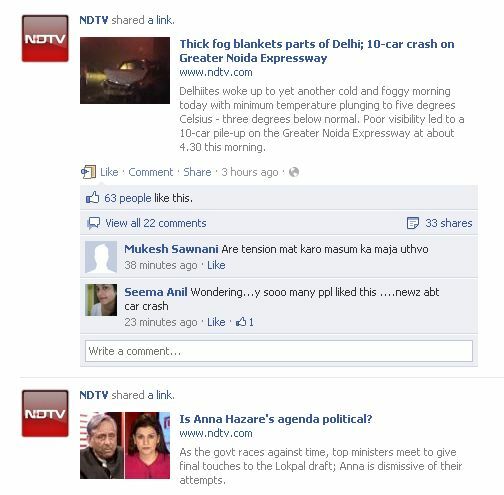 Despite having a large fan base, all NDTV does on their facebook page is ‘share links to their website.’ Okay, we get that they are India’s most credible source of news. However, if we go to their facebook page what’s the difference between the page and its website? There is so much opinion out there amongst their audience which can form the core content of their facebook page. Essentially the communication on Facebook should be an extension to what your brand really stands for and then build your communication around it. Now, time for your thoughts. Any examples of where brands have got their communication right or could do better?